After attending the MTH session at the NASG convention, I decided to add DCS to my Legacy controlled layout and to buy one of the F3's. Now I can run Legacy, TMCC and DCS engines from my smart phone or tablet using the MTH premium app. The app is very good and gives you access to nearly all Legacy functions. In fact, I haven't figured out any that I can't do yet. I have wanted to add wifi controls for a while, so I was excited to learn I could add one control interface that would allow me to run both Lionel and MTH engines even if its only F3's for now (not to mention all of my ERR TMCC modified locos). If anyone is interested, I can tell you what you need to buy and how to hook it up. The addendum on this topic available on the MTH web page will tell you most of what you need to know, but I did talk to one of the MTH experts to make sure before I purchased anything. I would be interested in hearing what you needed to buy and how you hook it up. Please share. So you can control legacy with the app also? I would be interested to hear/read what we would need to purchase, I do not at the present have any DCS motive power but who knows what might be in my future? The MTH app is surprisingly good. I didn't think I would like it, but I do. Give it a try before casting judgement. WIU to TIU (using the USB cable that comes with the WIU). Your power supply to TIU and TIU to track. For me I just cut the wires from my Powerhouse to my bus and inserted the TIU. I used 4 banana plugs, hot & common into TIU and hot and common out of TIU. Load the app and follow the WIU quick start up guide. Make sure you always start up the WIU first and let it establish connection before turning on power supply. I have mine powered so that it is always on, i.e. separate from the powerstrip that I flip on to run trains. Power up your track and use the app to start adding your engines to the app. For support, the MTH free addendum on using TMCC & Legacy available here: https://mthtrains.com/60-1406. Also, Jason Wenzel is the expert at MTH on this topic. That's neat but it's a little too rich for my liking. Thanks for the info. Yours is the only S-gauge DCS control experience with Legacy that I've seen posted on the OGR S-Gauge forum. Several folks have posted their success with DCC; I don't care to go the DCC route. I have been considering adding DCS to my S-gauge layout. I only recently added a Legacy Command Base and remote to my layout. My layout is 10 ft x 10 ft Gilbert tubular track + Gilbert 720A switches. I have 3 concentric loops interconnected by 720A switches and electrically isolated by fiber track pins at each switch. I have 2 MTH Z4000 transformers to power individual loops or a single transformer output for all loops at the same time. I switch MTH Z4000 transformer power amongst the loops via an Atlas 215 SPDT switch array. I also have 2 reversing loops electrically triggered via Atlas 200 snap relays wired to their respective Gilbert 720A switches. My layout is detailed in the following post on OGR ... https://ogrforum.ogaugerr.com/...ntage-gilbert-layout There are 2 attachments embedded in the post that detail my layout. I have an MTH F-3 diesel with Protosound 3.0. I'm able to run it via conventional AC transformer control and get horn/bell/whistle/dialogue via my MTH Z4000 transformer. With my block wiring and Atlas 215 switch I can run it on one loop while running other Legacy and/or FlyerChief engines on either of the other two loop at constant 18 volts. I have been waffling back and forth on whether to add DCS to my layout in order to control the locomotive at constant 18 volts in all loops via DCS control. However, have read some painful stories on the O-gauge side of OGR forum about folks having multiple and perplexing issues getting DCS to correctly operate on their layouts. I don't care to spend beaucoup hours trying to debug DCS on my vintage Gilbert layout. I bought and have read Barry B's books and have scoured the internet for insights on setting up DCS. My layout was not designed per Barry B's book layout guidelines. It does not use star wiring; it does not have isolated power districts in each loop. My layout was put together to run mostly traditional AC locomotives via transformer control. My subsequent addition of Legacy last month was slick and everything worked straight out of the box. I still use my Atlas 215 to wheel power around the 3 loops and/or open all loops to the same transformer power input. So, would appreciate your review of my layout as described in the above OGR post link. Then get your thoughts on likelihood of addition of a full DCS suite (TIU-L, Remote, needed cabling, etc) to my setup working as advertised. For wiring in the DCS system, my plan would be to wire 3 of the TIU's 4 in/output pairs between 3 of my 4 MTH Z4000 transformer outputs (remember, I have 2 MTH Z4000s) and the Atlas 215 SPDT switch inputs. Then retain the Atlas 215 switch outputs on out to my 3 concentric loop wiring buses as they are currently wired. I use the 4th MTH Z4000 transformer output to set up 18 volts to my 20 Gilbert 720A remote control switches. I do not want to include 720A switch control to either my Legacy or a new DCS control system; will continue to trigger the switches via their remote control toggles. I don't see anything in what you describe that would create problem for adding DCS in the manner that I described above. 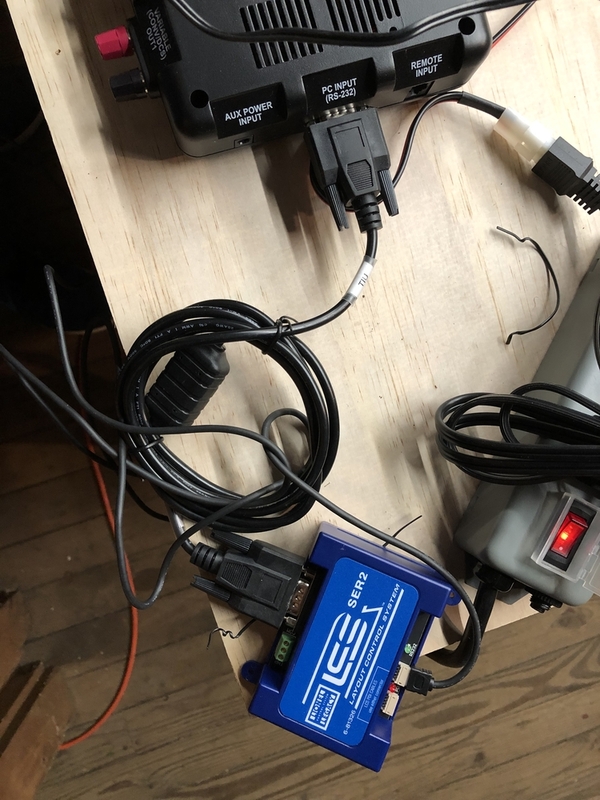 The only issue I have is that my WIU often doesn't recognize my TIU when I power up the track, but it is easily addressed by briefly disconnecting and reconnecting the cable between them. I do not have star wiring either BTW. I have 2 buses for my two separately powered loops. I am sure many folks consider it unnecessary, but I loved the combination of unlocking all the features of my MTH F3's plus being able to operate all of my Legacy and TMCC engines via the MTH app. Not to mention I was toying with getting an MTH Protosound 3.0 Std. gauge American Flyer Lehigh Valley brass piper repro as a Christmas train. I have since done so and use the WIU and TIU at this time of year to operate it on a track around one of my trees. Appreciate you taking the time to look over my layout and provide me your thoughts. I have 2 MTH F-3s with Protosound 3.0 ... they are good runners on my vintage Gilbert tubular track and switches ... which motivates me to go for it. So, with your good experience added to my ongoing online research of DCS ins and outs, I'm going ahead with purchase of full DCS components as you described above a year ago. 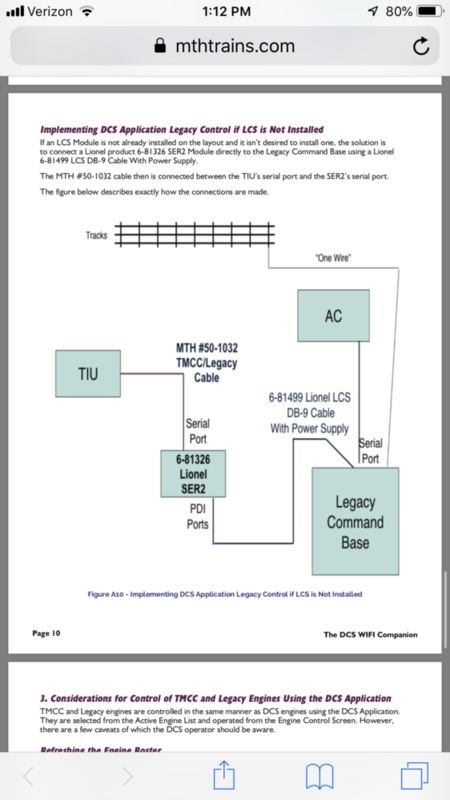 The DCS system's components are bulky and harder to wire in that Legacy. Examine the product carefully before you decide to jump into the expense. MTH may never build another S Gauge engine. TIU is 6" x 10" x 1.5"
WIU is 3" x 5" x 1"
MTH may never build another S Gauge engine. That was my first thought, as well. Unless you run O as well, that is a lot of coin just to unlock a couple features on two engines. You cannot buy the Proto Sound decoders to retrofit other engines, either, unless that has changed recently. I know you don't care for DCC, but it is a bit less to get into (~$300 with wifi) and you can fit a decoder to most any loco. You cannot buy the Proto Sound decoders to retrofit other engines, either, unless that has changed recently. Actually, you can. I don't know how long they have been selling them, but Protosound 3.0 conversion kits for steam or diesel/electric are readily available (but expensive). I haven't done one in S, but I know of people who have. Appreciate everyone's input. Interesting points of view for sure. Nothing is for sure on implementing DCS and Legacy/TMCC control on same vintage Gilbert track/switches. So, upon still further thought, I’m going to start out my DCS experience with just the DCS Explorer, PN 50-1035. I am aware of its limitations on control features compared to full up TIU/WIU combo and that it provides a max of 6 amps for track power and has a 5 amp fuse in it and is limited to max of 3 Protosound engines at one time and doesn’t communicate with Legacy/TMCC systems, doesn’t provide unique engine configurations, no lashups, etc. That’s all ok to me for my intended use. I am comfortable using my Legacy/TMCC remote for only Legacy/TMCC locos and using the MTH DCS Explorer with smart device only for the two MTH ProtoSound 3.0 locos that I now have. I expect the engines will do well in their respective control modes at constant 17-18 volts track voltage as long as I keep total track current comfortably below the Explorer 5 amp fuse rating. I'll send power as follow: transformer > my 5 amp inline fast blow fuse > DCS Explorer > Atlas 215 SPDT switch array > Track loops. I'll wire the DCS Explorer ground output to my overall ground bus terminal strip for the overall layout. So, how much current does my layout usually require? I just ran my two MTH F-3s that have ProtoSound 3.0 using conventional AC transformer throttle controlled voltage to the track. I had them running off of the same Z4000 single throttle up to ~14 volts at a good speed with incandescent-lighted passenger cars on one engine and freight cars on the other engine. I had them running on 2 separate track loops. With that, my Z4000 digital amp reading is ~2 amps. I then ran a TMCC Lionel American Flyer steamer with freight cars at the same 14 volt throttle setting off of the same Z4000 throttle on my 3rd track loop along with the 2 MTH F-3s. 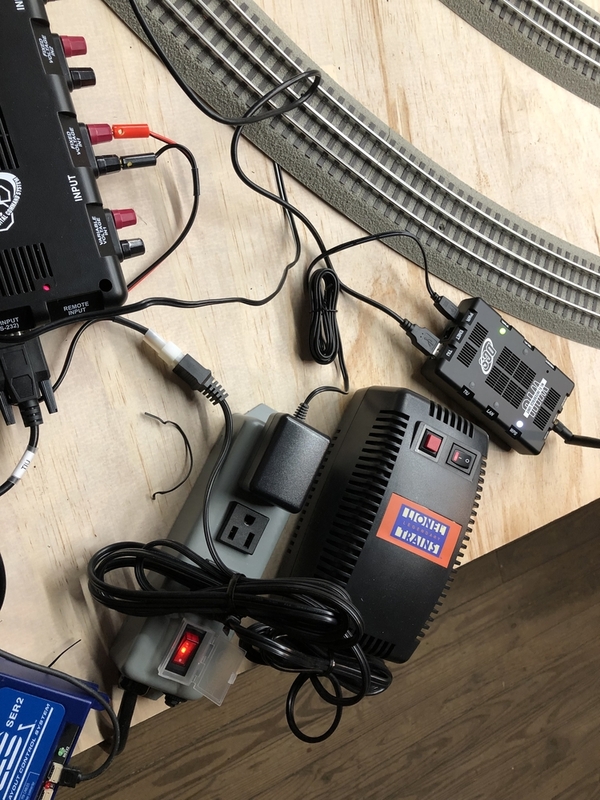 The Z4000 digital current reading was still only about 2.3 amps with all 3 trains running at a good speed at ~14 volts. I didn't want to go above 14 volts because the MTH F-3s would've jumped the track on my R20 curves. But 14 volts was enough to power and control the TMCC steamer via Legacy handheld remote. Operating either the steamer whistle or the F-3 horn upped the total track current from the transformer to ~3 amps while the horn/whistle was ‘on’ then dropped back to ~2.3 amps again after disengaging the horn/whistle. All of this using only one of the Z4000 throttle power outputs switched to all 3 of my track loops at the same time via my Atlas 215 SPDT switch. So, looks like I have ample margin for current draw less than the DCS Explorer 5 amp fuse. So, I’m pretty sure that just the DCS Explorer will give me a good taste of DCS operation on my vintage Gilbert track/switch layout while still enabling me to run multiple Legacy/TMCC/ProtoSound 3.0 trains at the same time at a constant 17-18 track volts using either the Legacy remote for Legacy/TMCC engines or the DCS software application for ProtoSound 3.0 engines on a smart device like iPhone or iPad. I just need to closely watch my track current draw. I don't generally run my smoke units so that lessens current draw too. I can always electrically bypass the DCS Explorer via my Atlas 215 SPDT switch array if/when needed for higher current draw situations like running my conventional locos. I plan to wire the DCS Explorer between my Z4000 and one of the inputs on my Atlas 215 SPDT switch array. I already have a 5 amp quick blow fuse wired inbetween my Z4000 and my Atlas 215 SPTD switch array; I’ll let it there. That fuse does blow quickly when I have a derailment like crossing into a Gilbert switch that’s in the wrong position ... have done that a few times. I believe that retaining my 5 amp quick blow fuse between Z4000 and DCS Explorer will cause my inline fuse to blow before the DCS Explorer 5 amp fuse which is my preference. I have a bunch of spare 5 amp quick blow fuses for such derailments. I could use a 4 amp inline fuse to avoid blowing the DCS Explorer fuse. Will figure that out later. My track layout has operated fine with my current 5 amp inline quick blow fuse for up to 3 trains with incandescent-lighted passenger cars and or freight cars. Typical current draw has been running ~2 - 2.5 amps with increase to 3 amps total when operating horn/whistle. So, I'm optimistic that this lower cost DCS Explorer investment will show me if DCS will work ok on my vintage Gilbert track loops and Gilbert switches. 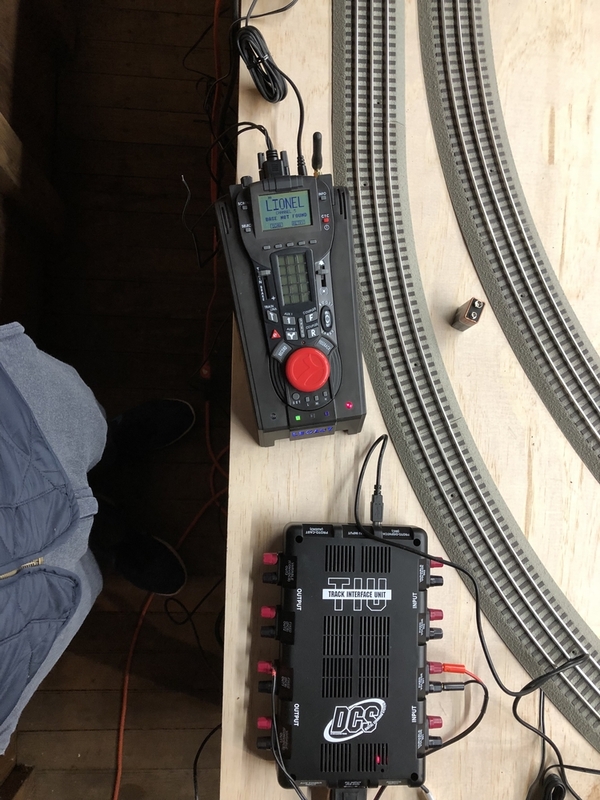 I am optimistic that my Legacy and TMCC locos will operate simultaneously with MTH Protosound 3.0 locos using their respective controls as long as I keep total track current through the DCS explorer comfortably below its 5 amp fuse rating. I'll try it with one loop; if ok, will add 2nd loop; etc. If DCS signals prove to be insufficient for one or more of my multi-loops, I'll drop the DCS Explorer and be content with my good-running Legacy/TMCC controls. I will report my experience upon getting things up and running. I know they have conversion kits to upgrade Proto 2 to 3. The ones I am referring to are kits for adding Protosound 3.0 to any loco: Products 50-1911 and 50-1912.